On episode 126 Harley and Brett are headin’ back to Callie to revisit a town with a perfect climate, blue sky, clean air, world-famous thermal winds for aerial sports and, the crowning jewel, a sparkling 3,300 acre recreational lake, Lake Elsinore, California. We found a new oddity in an old town. 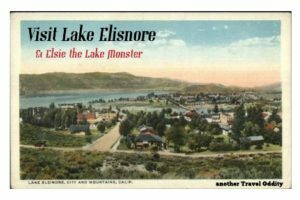 Not only does Lake Elsinore have a haunted highway, but it also has its own lake monster, Elsie. Not interested in a monster hunt? Maybe you could check out The Cleveland National Forest. This place has top notch hiking, biking and even bird watching. If you are feeling more adventurous, check out Skull Canyon for some extremely high zip line fun(?). No Episode of the Travel Oddities Podcast would be complete without a place to grab a bite, and The Lake House Elsinore may be just what you are craving. Can’t get enough Lake Elsinore? Check out Episode 98, where we discuss the Haunted Ortega Highway and a lot more about Lake Elsinore.